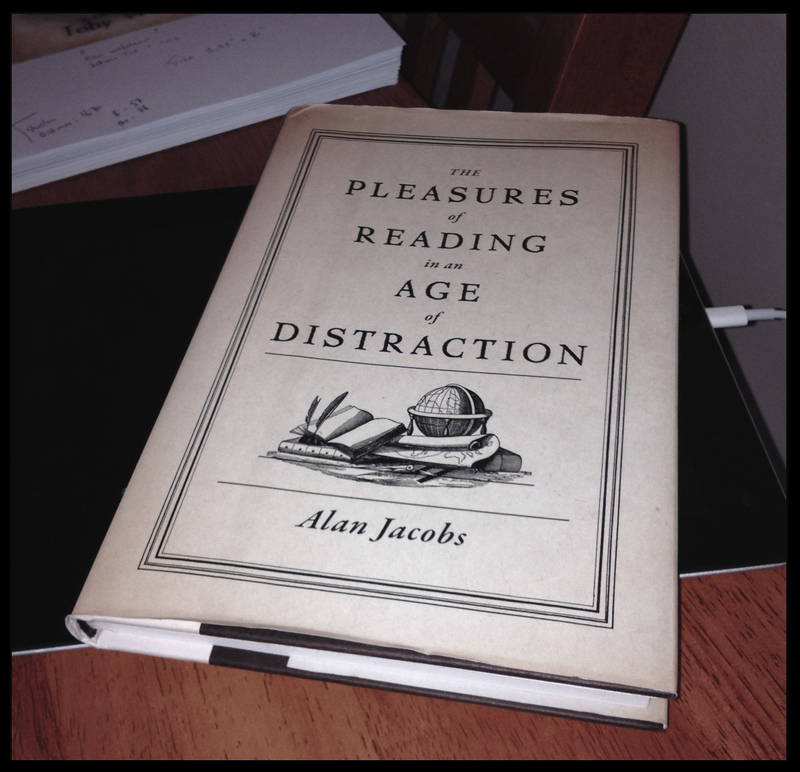 I just finished reading The Pleasures of Reading in an Age of Distraction by Alan Jacobs. Scott Pack, over on his blog, gave it such a thorough recommendation that I rushed off to get a copy. It was a really refreshing read, covering ideas like why it is OK to read Harry Potter, why you don’t have to read anything you don’t want to and why those books that tell you what you need to read before you die might be worth ignoring. Those ‘1001 before you die’ books always seemed to be coming at things from the direction to me. And the way they use the word ‘need’ seems so presumptuous. Jacobs book is a fascinating analysis of why we read, how we read and tries to assuage some of the pressures that seem to come with reading. Am I reading the right books? Am I reading them well enough? Am I reading them fast enough? The suggestion, repeated throughout the book, is to read at whim, and to just take slow pleasure in it. Every now and then someone will seem impressed by the fact that I read a lot. They will say that they wished they could read more, in the same way that I often tell joggers that I wish I could exercise more. Reading is seen as a superior way to spend your time. I think this might be a hangover from childhood where we are all encouraged to read, which is usually met with resistance because reading, when you are not used to it, is actually hard work. In fact it can be hard work even when you are used to it (my copy of Dostoevsky’s The Idiot is still unread). So when we read as children we get praised, same as when we ate the broccoli, and so grow up with the idea that reading is eating vegetables and watching TV is calling out for a pizza. But that division doesn’t really work. The last book I read before Pleasures of Reading was Do No Harm, the memoirs of a brain surgeon. Once I had finished that I watched a documentary that had been made about the author. Is one more valuable than the other? Did reading his words give me more than watching his actions? (I’ll tell you one thing, the documentary was a lot harder to watch than the book was to read). Now that I have been reminded that it is OK to read whatever the hell you please and that you don’t need to only read ‘worthy’ (whatever that means) books to be spending your time well I am probably going to read The Girl Who Played with Fire. I read The Girl with the Dragon Tattoo a few years ago, liked it well enough, but didn’t get around to the sequel. That book, I am sure, is going to be pure pleasure. My reading tends to be more on the challenging side than on the fun side, but why not have a bit of fun? It might not change me, but it doesn’t have to. There was a section in The Pleasures of Reading that reminded me of when I was younger and the way I read. When I was in school I read, almost exclusively, Terry Pratchett, Anne Rice and JRR Tolkien. I did not read widely, but when I did read I felt like the world was opening up to me. This was pre-internet (at least in any meaningful sense) and there were four TV channels of which the odds of there being something on that I wanted to watch was slim. Reading was a way of opening the four walls of my bedroom. That’s different now. Now when I read it is more like I am trying to build walls up around me, shutting the world out and just becoming absorbed in something else. Jacobs refers to building a ‘cone of silence’, I knew exactly what he meant by that. Reading should be one part of our cultural experience. I don’t watch anywhere near as many films as I used to, and I am sure I am the poorer for it. But I do love reading and so this book was a genuine pleasure to read. I really enjoyed this book as well. Thanks for your thoughtful review.